For instance, a recent psychology study, led by Brock Bastian, demonstrated through a series of clever laboratory experiments that experiencing shared pain increased ‘bonding’ and enhanced co-operation with an in-group, when compared against similar collective experiences that did not involve pain (see my previous review for more details). Significantly, the methods employed to measure ‘bonding’ and co-operation included both self reported items (such as, “I feel connected to the other participants” and “I feel like there is a unity between the participants in this study”) and, in the later experiments, an economic game in which participants could earn higher rewards when all the members of the group cooperated. The results obtained in these experiments also echoed recent findings from the innovative field research of Dimitris Xygalatas and his collaborators, which demonstrated that observers and participants of a dramatic Hindu piercing ritual were willing to sacrifice more of their awarded research payment by donating it to a local Hindu temple, than those who had performed prayers, as part of the same event, a few days earlier. In Mauritius, where this study was conducted, self reported religiosity and religious self identification are much higher than in Japan and, as such, it is an open question whether the prosocial effects observed in religiously committed devotees would also be found amongst ritual participants in a population that lack strong devotional beliefs. My hunch for what its worth is yes. But this is one of the questions that I am currently seeking to address empirically by conducting research at extreme ritual events in Japan. Recently, as part of these efforts and together with a small research team, I visited two fishing towns located in the North of Hokkaido, the most Northern (and largest) prefecture in Japan. 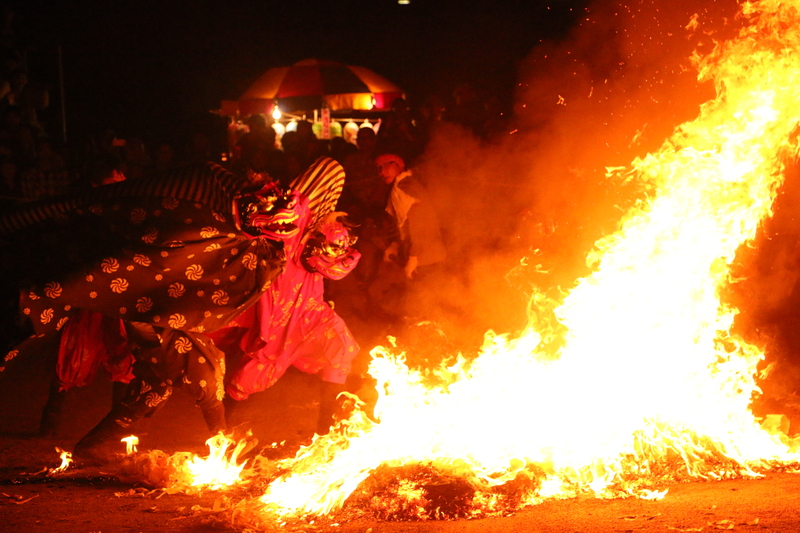 These two towns (Furubira and Shakotan) hold dramatic tengu themed fire walking festivals every year organised by the local Shinto shrines. 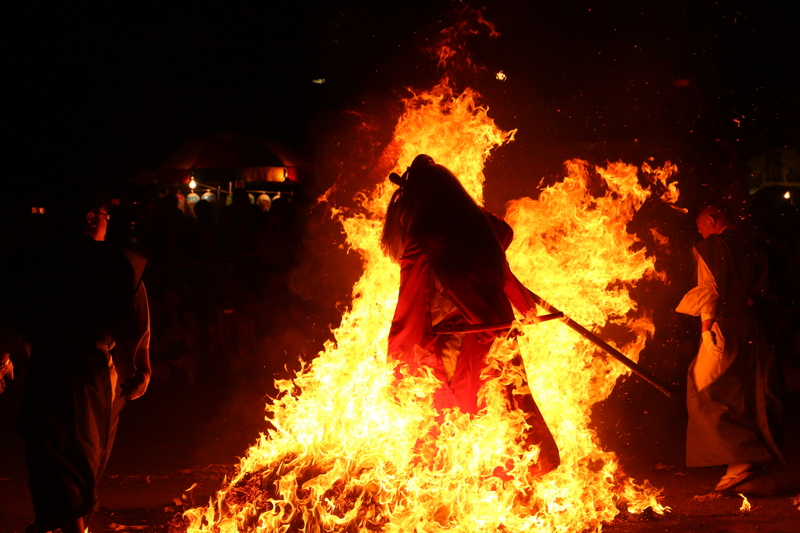 During these festivals one local performer dons an elaborate tengu costume and leads the festival celebrations, which culminate each evening with a series of dramatic fire walking events. A tengu, for those unfamiliar, is a mythological Japanese creature that, in the modern era, is most commonly represented as a red faced humanoid figure, with a long protruding nose (as illustrated at the top of this article). 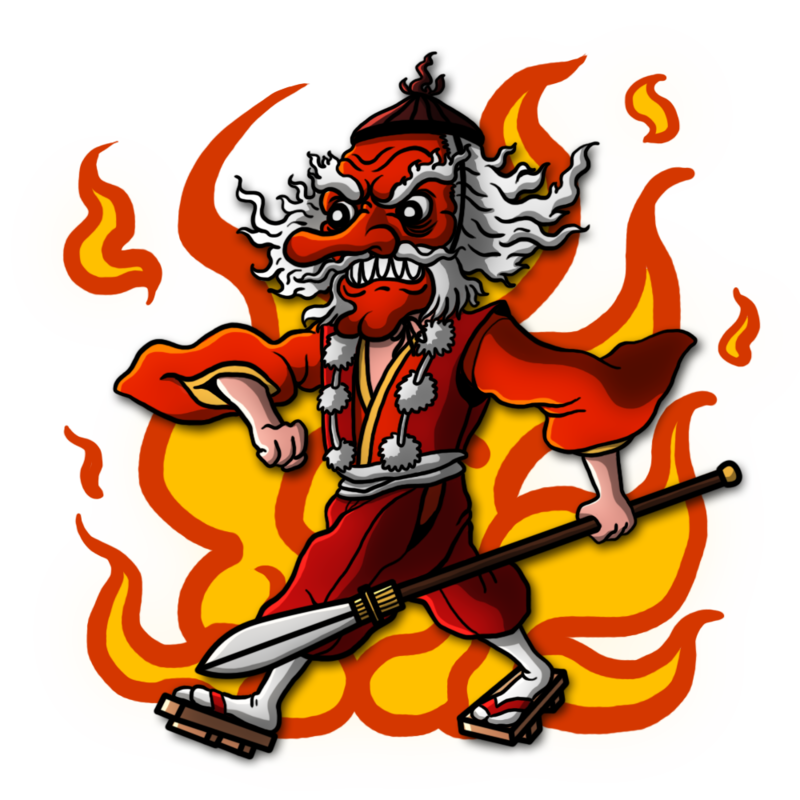 … and Shakotan’s tengu with its flammable looking beard. The original concept of the tengu is believed to have derived from the Chinese legendary concept of a ‘heavenly dog’ (天狗) and migrated to Japan from China, along with Buddhism, sometime during the 6-8th Centuries. However, following their arrival in Japan, these ‘heavenly dogs’ underwent a rather dramatic transformation; morphing first, from celestial canines into monstrous demon birds, and then later, becoming anthropomorphised into the long nosed, mischievous creatures seen above, and sometimes portrayed as lesser deities associated with mountain asceticism. A bird-like Tengu portrayed by the artist Kawanabe Kyōsai. 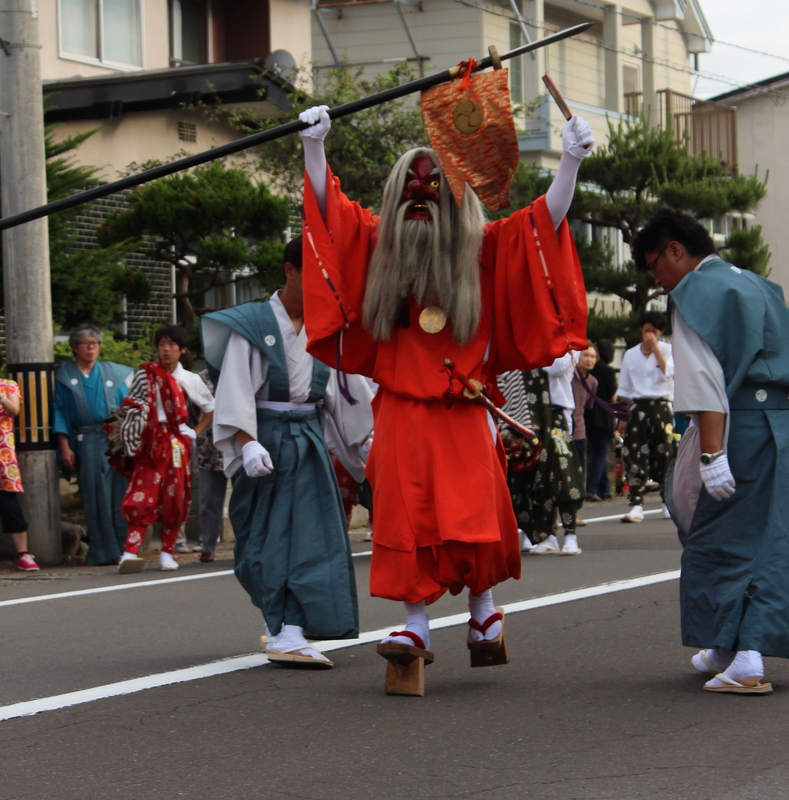 The protector deity version is the type that featured in the fire walking festivals I attended but, despite being co-opted as protective entities, the ambiguous nature of the tengu and their association with trouble and danger, have by no means disappeared. 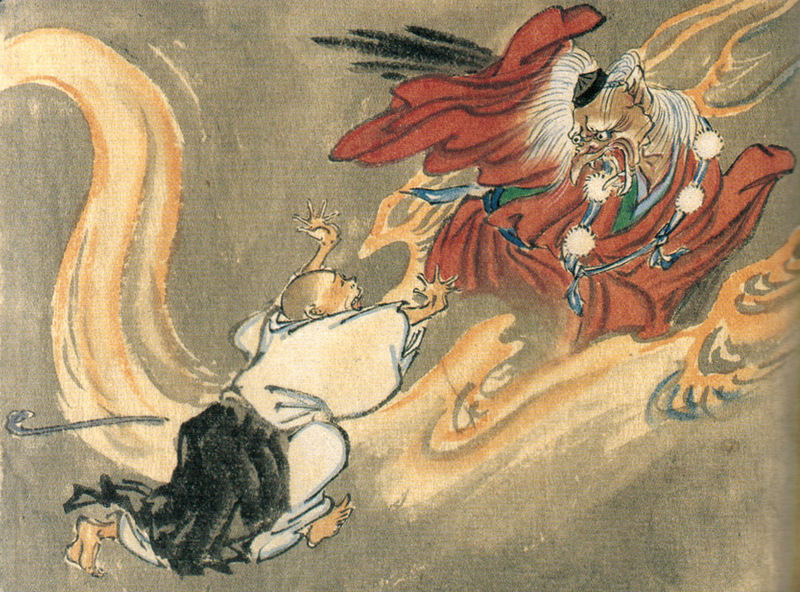 Thus, the head priest of one of the shrines visited took visible pleasure in recounting to us how, when he performed as the tengu, he had infamously punched a bus driver for startling him with the glare of his headlights and struck with his spear an inpatient car that had tried to pass the festival procession. He did, however, admit that these actions were at least partly, fuelled by significant amounts of alcohol and hence, might have less to do with the channeling of some primordial tengu spirit and more to do with the mischievous nature of that particular shrine priest. The Tengu rules the road. Returning to the events from this year, the tengu strikes an impressive character and the image of this long bearded figure striding (remarkably slowly) through a wall of flames will stay with me for a long time. 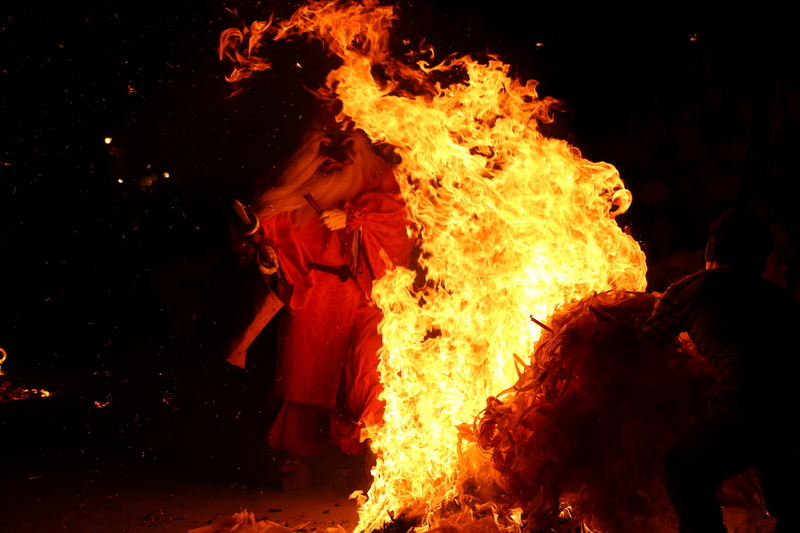 However, he is not the only person during these festivals to walk (or in the latter case, to charge) through the flames. 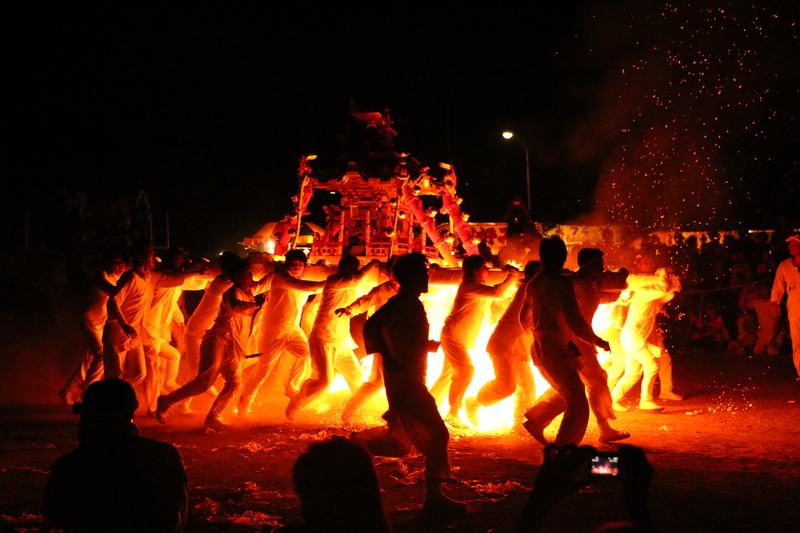 There are also a number of groups consisting of about twenty local people who carry heavy wooden ‘portable shrines’ (mikoshi 神輿) through the fire, and during the event in Furubira, there were four local teenagers who performed a fire walking version of a ‘lion dance’ (shishi-mai 獅子舞). Incidentally, detailed (and very readable) first hand accounts of participating in the Shakotan firewalking events are available on Luke Kelleher’s blog (an ex-English teacher/resident) here and here. 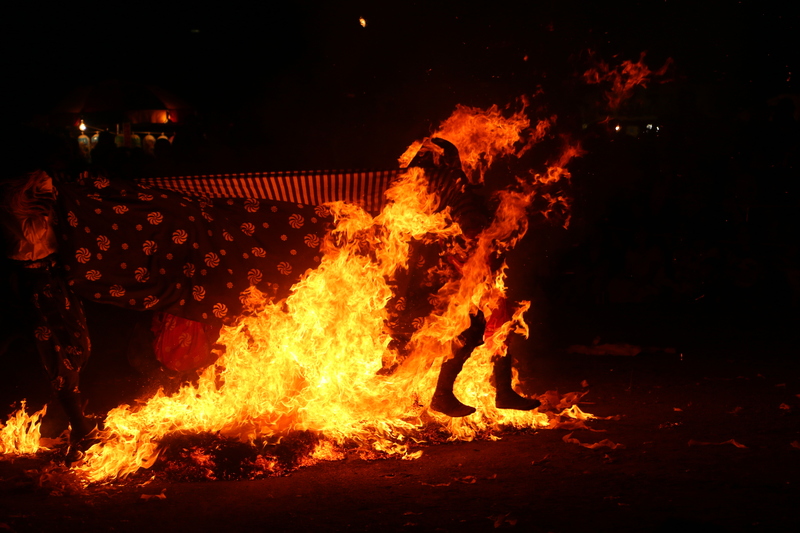 As the images above and below indicate, the fire walking in these events are much more fire-based than is typical in other well known ‘fire walking’ events, which usually involve walking over hot coals. 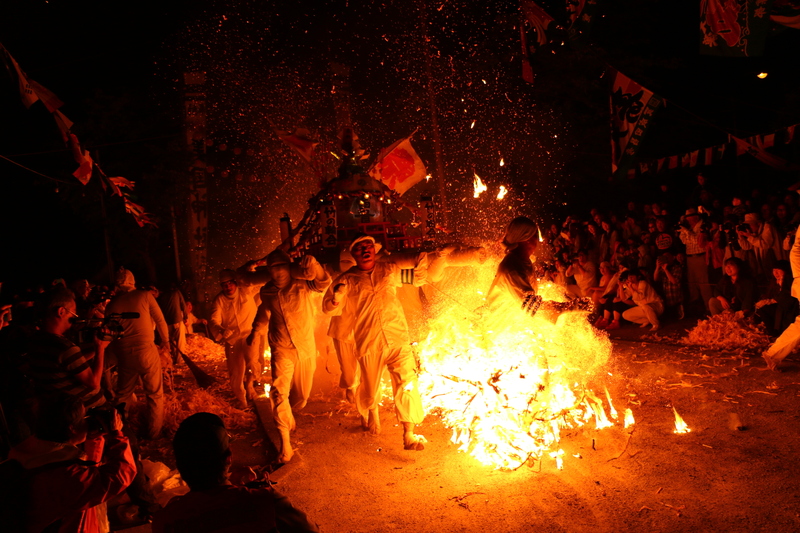 My experiences to date suggest that these kinds of flaming festivals are more typical of Shinto fire walking events, rather than of Buddhist ones, which also occur in Japan but tend not to feature the tengu motifs or collective fire walking. In such Buddhist events individuals walk, one by one, over the coals and while this is undoubtedly also a physically arousing experience (even if only through psychological stress) it certainly seems to present a less ‘visceral’ shared experience than that experienced by the mikoshi carriers at the Shinto festivals (see the images below). Whether the consequences of these different varieties of shared arousal translate into different behavioural outcomes, produce distinct psychological impacts or contribute to differing social interactions/structures, are all unresolved questions and are also part of what I’m currently investigating in my research. For now however I am not attempting to offer answers, just to share some information and images from my current research, but you can expect further posts in the future concerning the data we collect and my evaluations of related theories. Finally, I would also be remiss not to point out that my research is funded by a subgrant from the John Templeton foundation but is also part of a larger ESRC funded Ritual, Community and Conflict project headed by my supervisor Harvey Whitehouse. Philosophical objections/debates about accepting Templeton funding can go in the comment section but from my experience there has been absolutely no interference with my research agenda. 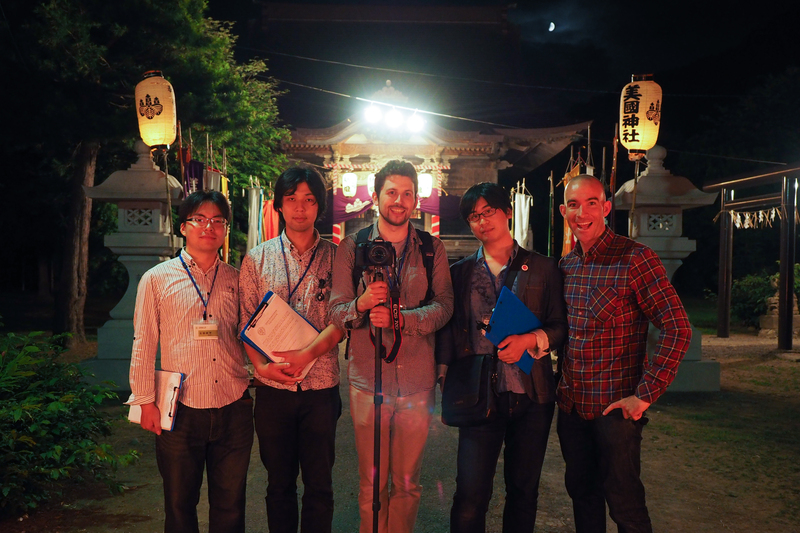 I also could not collect any data without the cooperation of the shrine/temple authorities and the assistance of Masaki Yuki and his research lab, some of whom you can see in the image below. ← New Evidence for Life After Death? Good article. Fun photos and your Thai buddy did a fantastic drawing. Having lived in Japan the superstitions there stood out strongly for me too. Mind you, India had the same. But the contrast of religiously active but dogmatically weak also stood out to me. Chris, do they have “mudders” in England? I imagine you have Polar Bear Plunges. People who do these things, or go to hotly contested sporting events bond together. Before the Roman word “ritual” was invented, I wonder what these were called? That people crave to bond like this, is an interesting event. Perhaps linked to brain reward for tribal warring? Or maybe just a body trick we discovered to trigger our bonding pleasures. But being religious or not, seems secondary — instead, religion is just another piece of glue to hold the phenomena together. Agreed about the illustration, he is fantastic, I’d like to promote his work more but he’s still working on his website. As far as Hokkaido goes, I’m actually here mainly because of wanting to work with Masaki Yuki & his lab, my wife is originally from Kyōto so it’s a new environment for both of us! I also fully agree with your point about bonds built through shared ordeals not being restricted to religion. They are found in sports, various subcultures and military training, to name a few non-religious contexts. I would however also note that religion is historically one of the primary motivators for this kind of behaviour. And in Japan, the extent to which religious symbolism and, indeed, a vague concept of karmic merit, still permeates such events is quite remarkable, especially given the religiosity statistics. I’m not arguing at all that this is an exclusively religious phenomenon though, I just think the combination of rich symbolism, causal opacity and synchronised movement that often accompanies religious rituals significantly heightens the more general bonding effects of shared pain. religion is historically one of the primary motivators for this kind of behaviour. And you’d agree that the other “primary” motivators include at least: war, sports and fraternities, right? But since war proceeded all, religions are just imitators, eh [でしょう)? Sure, experiencing shared ordeals through combat is probably one of our species’ oldest bonding/affiliative mechanisms. So in that sense the fundamental evolutionary origin for the bonding effects of dysphoric rituals are unlikely to have anything to do with ‘religion’. Religion is ‘one of’ the primary motivators for these behaviours but it’s certainly not the only one or the oldest if we include conflict/war… it may however represent one of the most effective means of producing/promoting the desired effects. It’s definitely not a settled question though. Wow, those are some great photos – I almost feel a bit singed just looking at a couple of them. Xygalatas’s AEON piece was good too – really brings the research carried out in Spain and Mauritius to life. I look forward to your future posts on this – thanks!